Tub shower wall kit includes 1 back wall, 2 side walls and 1 corner glass shelf. CST/berger RL25HVCK Complete kit is a horizontal and vertical dual beam single slope interior and exterior rotary laser that delivers professional performance at an affordable price. The RL25HVCK is ideal for exterior and interior general construction and aligning jobs such as grading, concrete forms and pads, site prep and elevation transfer as well as interior jobs such as building, drop ceilings, electrical installation and other alignment jobs. Includes: remote control, RD1 detector with bracket, laser glasses, magnetic target, adjustable wall mount, batteries, aluminum tripod, 8 Ft. levelling rod, and a carrying case. Install this Single Handle Wall-Mount Lavatory Rough-In Kit for use with the wall-mount lavatories. This lead-free brass body ships with the valves and plaster guards for a hassle-free installation. As part of a company that delivers water every day through millions of faucets worldwide, Delta provides a lifetime limited warranty on all parts to the original consumer. Utile 30-Inch x 60-Inch Shower Wall Kit in Stone Sahara Create a sophisticated bathroom space with unparalleled ease and speed. Utile by MAAX is an innovative shower wall solution that comes in a range of rich colours, deep textures and stylish patterns that look and feel like tile, yet installs easily in just 1 day versus 3 days for standard ceramic tile. 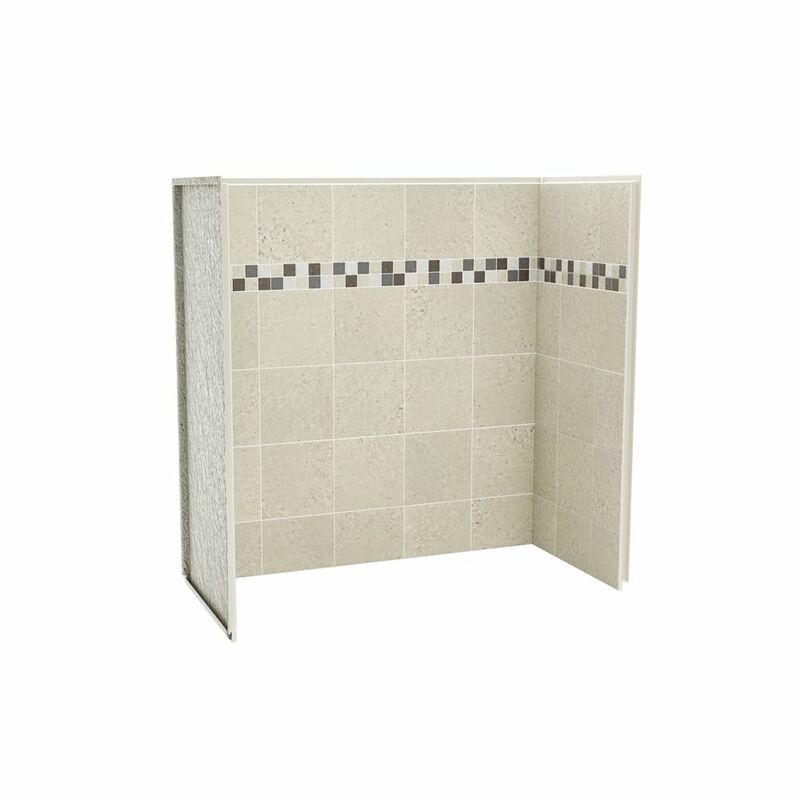 Utile 30-Inch x 60-Inch Shower Wall Kit in Stone Sahara is rated 3.7 out of 5 by 3. Rated 1 out of 5 by kkkkkkkkkkkkkkkkkkkkkkkkk from Maxx shower wall kit just a pretty face. Purchased several months ago.Lots of problems locking in one end after installation dry wall ,the shower end panel the ply's of the surface material separated from the fiberglass backing. in a 16 inch area.Maxx said call Home Depot who said call maxx.This unit should not be a choice for anyone , it is rated low for a reason I ignored. There are numerous choices for 1/2 the money anywhere.It protects my walls and the idea was good not the product. Maxx said tear it all out go to home depot and ask for a replacement yup that easy. Just need to rip the bathroom out to get at it. Rated 5 out of 5 by Catherine from Easy to install We love it! It fastens directly to the wall studs and the 2 side sections slide on nicely. One thing we did find is that needed the drywall behind it on one end, but not both. We also installed a couple of screws at the top to hold it close to the wall at the top. Perhaps its meant more for a newly constructed bathroom versus a reno job. How to place an order on line? I don't see the button. Hello Oliver, We thank you for your interest towards our Utile products. For all assistance in ordering this product online, you should communicate with Home Depot directly so they can assist you. Hello Bolo, We thank you for your interest towards our Utile walls. The Utile tub surrounds do actually have a maximum height of 60&quot;, we do offer a shower wall surround with walls that are 80&quot; but we would have to ask you to call us at 1-877-438-6229 OPT 2 OPT 2 for one of our technical advisors to gather a bit more information to confirm if this would be a suitable option for you. Can the MAAX Utile tub surround kit be used with most acrylic and fiberglass tubs? And can a hole be cut in this type of surround to accommodate a window? Thanks. The Maax Utile Tub shower wall kit is only guarantied to fit Maax products. The Maax Bath tubs are as follows: the Cocoon, New Town, Avenue and the Bosca. Utile should not be cut to fit around a window, this will void the warranty. If I was to remove the old surround, could I insert this one directly or do I need to remove the bathtub first? If not, would this surround go over the lip of the tub? Home Depot stocks many frameless shower door styles. The one pictured here is the &quot;Halo&quot;, they should have it in stock. Can you cut this product to fit around a window?